Spent some time last night working on pictures from Caroline and Brandon’s wedding. More pictures from: Jake Holt, the official wedding photographer, Grant, Jess & Cy. Wedding photography looks like very stressful work. I’m pretty pleased with the way some of these pictures turned out but having to get a spectacular picture of every wedding “scene” is tough. I’m sure the extra flashes and L lenses make it a little bit easier, but probably not that much. I enjoyed chatting with Jake towards the end of the evening; at the time his biggest complaint was his back, from lugging around two big camera bodies. Very early in the evening I switched to my cheap 50mm f/1.8 because of the low light. Lee generously gave me his flash diffuser, which was very helpful for reducing the harshness of the light from the flash. One of Jen’s classmates recommended that we check out Capone Foods, a food store specializing in fresh pasta right in our neighborhood (near Union Square, Somerville). While I was out running errands a few weeks ago I stopped by. As I stepped in through the door, I was greeted by a large glass-doored refrigerator full of pastas and sauces. A handy chart posted on the wall presented sauces and types of pasta in a matrix marked with the recommended combinations. After poring over the chart and soliciting a recommendation from the young lady behind the counter, I decided on chicken-prosciutto ravioli with tomato-porcini sauce. 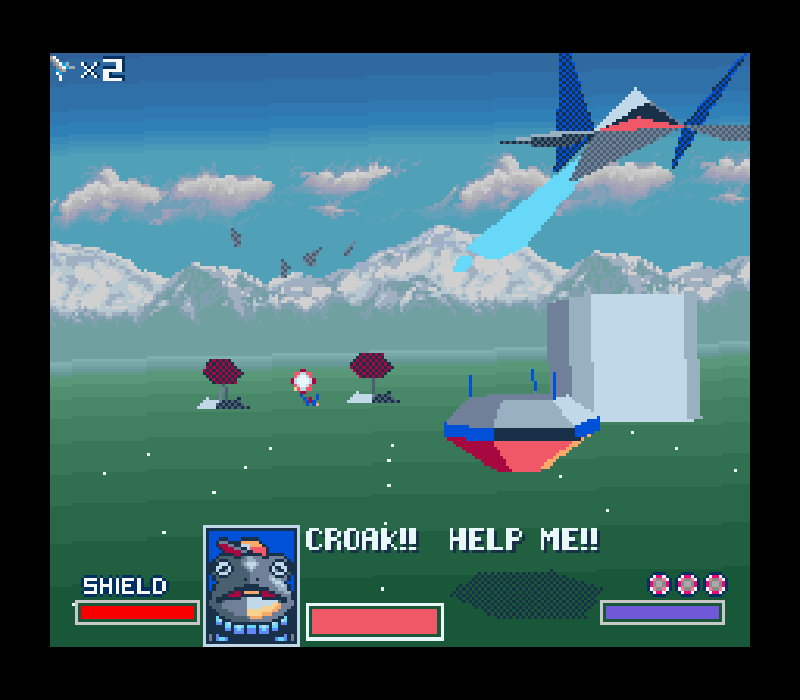 Somehow I was able to contain the temptation to pick up a freshly baked loaf of bread or some cheese. 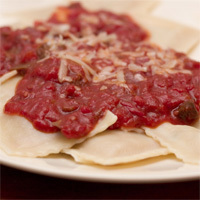 We had the ravioli for dinner the following evening. Preparation was quick and easy. While I was expecting a little more flavor out of the ravioli, the texture was good and the sauce was robust and flavorful. Will definitely be heading back to sample the fresh pasta; the store may become a weekly stop on the way back from the farmer’s market this summer. 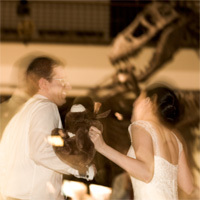 Surrounded by fierce dinosaurs, tie-wearing bears, and loving friends and relatives, Caroline and Brandon were married this past weekend at the Houston Museum of Natural Science. Erin did a fantastic job of officiating the ceremony. The wedding and weekend were incredibly fun. Made some new friends and caught up with some old ones. Jess, Cy, Grant, Kent, and I shared a room. Food-wise, we did pretty well. Enjoyed succulent ribs, tender brisket, and tasty sides at the rehearsal dinner (Goode Company), Cajun-style boiled crawfish ($4/lb) at lunch the next day (Bayou City), and five slices of pie during a post-wedding dessert-run (House of Pies). All of the above are highly recommended. We also stopped at the expectedly underwhelming Yao Restaurant & Bar for drinks. Other than the really tall doorways and case full of basketball memorabilia, it doesn’t have a whole lot going for it. I am a bit sad that we all had to go our separate ways afterwards. Congratulations once again to Caroline and Brandon and their families! This was a special request from Jen. The meatballs ended up a little flattened; some time in the fridge might have helped them to maintain their shape. The sauce is simple, but good. Also, I skipped the last step of tossing the pasta with the sauce (because I didn’t read carefully enough). 1. For the meatballs: Combine the bread and buttermilk in a small bowl. Let sit for 10 minutes, mashing occasionally with a fork, until a smooth paste forms. 2. Place the ground meat, cheese, parsley, egg yolk, garlic, salt, and pepper to taste in a medium bowl. Add the bread-milk mixture and combine until evenly mixed. Shape 3 tablespoons of the mixture into a 1 1/2-inch round meatball. (When forming meatballs, use a light touch. If you compact the meatballs too much, they can become dense and hard.) You should be able to form about 14 meatballs. 3. Pour the vegetable oil into a 10- or 11-inch saute pan to a depth of 1/4 inch. Turn the heat to medium-high. After several minutes, test the oil with the edge of a meatball. When the oil sizzles, add the meatballs in a single layer. Fry, turning several times, until nicely browned on all sides, about 10 minutes. Regulate the heat as needed to keep the oil sizzling but not smoking. Transfer the browned meatballs to a plate lined with paper towels and set aside. 4. Meanwhile, bring 4 quarts water to a rolling boil in a large pot. 5. For the sauce: Discard the oil in the pan, but leave behind any browned bits. Add the olive oil and garlic and saute, scraping up the browned bits, just until the garlic is golden, about 30 seconds. Add the tomatoes, bring to a simmer, and cook until the sauce thickens, about 10 minutes. Stir in the basil and salt and pepper to taste. Add the meatballs and simmer, turning them occasionally, until heated through, about 5 minutes. Keep warm over low heat. 6. Add 1 tablespoon salt and the pasta to the boiling water and stir to separate the noodles. Cook until al dente, drain, and return to the pot. Ladle several large spoonfuls of the sauce (without meatballs) over the spaghetti and toss until the noodles are well coated. 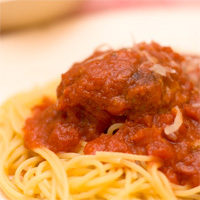 Divide the pasta among individual bowls and top each with a little more tomato sauce and 2 or 3 meatballs. Serve immediately, passing the cheese separately. I’m always looking for good salads to make. 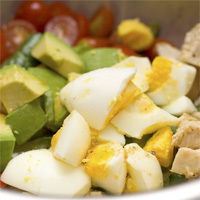 This one’s got tons of good stuff (avocados, chicken, eggs, tomatoes) and an excellent dressing. All that dicing is pretty labor-intensive, so my pieces didn’t end up being that cube-like. I left out the bacon and bleu cheese since I was trying to keep it healthy. 2. For the salad: Meanwhile, season the chicken with salt and pepper. Adjust an oven rack to 6 inches from the broiler element; heat the broiler. Spray the broiler pan top with vegetable cooking spray; place the chicken breasts on top and broil until lightly browned, 4 to 8 minutes. Using tongs, flip the chicken over and continue to broil until the thickest part is no longer pink when cut into and registers about 160 degrees on an instant-read thermometer, 6 to 8 minutes. When cool enough to handle, cut the chicken into 1/2-inch cube and set aside. 3. To finish the salad: Toss the romaine and watercress with 5 tablespoons of the vinaigrette in a large bowl until coated; arrange on a very large, flat serving platter. Place the chicken in the now-empty bowl, add 1/4 cup of the vinaigrette and toss to coat; arrange in a row along one edge of the greens. Place the tomatoes in the now-empty bowl, add 1 tablespoon of the vinaigrette, and toss gently to combine; arrange on the opposite edge of the greens. Arrange the reserved eggs and avocados in separate rows near the center of the greens and drizzle with the remaining vinaigrette. Sprinkle the bacon, cheese, and chives evenly over the salad and serve immediately. Whole Foods is a pretty amazing grocery store. 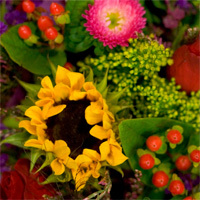 Their food is expensive, but just about everything in the store looks fresh and well-arranged. A few weeks ago I found myself there with my camera. I snapped a few pictures before I was told to ask the manager for permission. I sheepishly went about my shopping.